Identification: This species has moderately tall parapodia that meet in a frilly margin. There are widely scattered papillae that become much more prominent on the parapodial margin. It is usually bright yellow with minute rust-brown flecks, scattered white spots, and a white marginal band on the parapodia. Some animals, however, have dark interior pigment. (Note 1) The white pigment is usually more prominent in larger individuals. 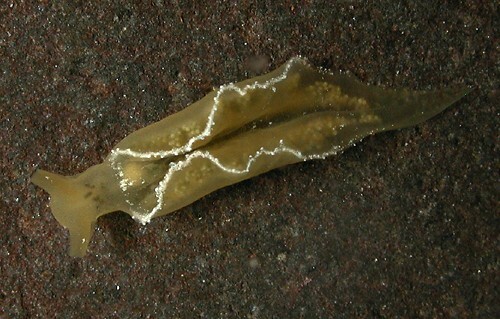 Natural history: Elysia obtusa is a moderately rare plakobranchid found on shallow rocky bottoms. It occurs in highly protected to moderately protected locations from the low intertidal to depths of 1.5 m (5 ft). Mature animals are nocturnally active. The lack of consistent dark pigment suggests that it does not store chloroplasts. A 7.5 mm animal laid a tightly coiled, pale orange egg mass. It had evenly spaced "knobs" on the outer surface of the outer whorls that were filled with dark orange extra-capsular yolk. Hatching occurred in about seven days in the laboratory. The extra-capsular yolk remained in the egg mass after hatching. Taxonomic notes: This species was previously lumped with Atlantic animals under the name Elysia flava Verrill, 1901 and it is listed under that name in many older sources. It was first recorded in Hawaii from Hekili Point, Maui by CP on May 9, 1992. Photo: CP: 7.5 mm: Hekili Point, Maui; April 16, 2006.